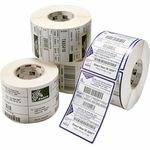 Genuine Zebra LP2844 direct thermal labels for use with Zebra LP2844 direct thermal label printers, Core size - 25mm. Direct thermal labels are do not use thermal transfer ribbons to print. Both the Z-Perform 1000D (economy) and Z-Select 2000D (premium topcoated) TT labels are guaranteed to work with both the Zebra LP2844 and LP2844-Z printers. If you are new to these types of consumables take a look at the ZipShip selector guide to help you make the right choices. Alternatively please call our sales team and ask to speak to a media expert. If you select a product which does not appear in our parts lists below WE CAN STILL SUPPLY IT - and will probably have stock. Please call us to check availability. If you are not sure which label you need, Just , Ireland Ph: +353 (0)1 4433964 - UK Local PH: +44 (0)20 8144 4475 and we will be more than happy to help you find which labels you require. Free UK & Ireland Delivery!